Since 1962 the Lobster Claw Restaurant has served as an ideal location to enjoy a delicious meal and fine spirits in a comfortable atmosphere for a great price. Whether you are one of our regularly returning customers or are planning on visiting us for the first time, we would like to invite you to enjoy a lunch or dinner at a place that will make you feel like you are right at home. 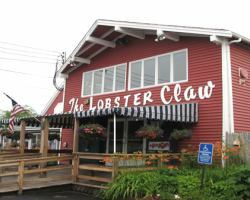 Known as the best family restaurant on Cape Cod, The Lobster Claw is cheerful, unpretentious and immaculate. The varied menu always guarantees fresh seafood including boiled and baked stuffed lobster, steamed clams, fresh swordfish, haddock, salmon and other native fish. Relax in our Surfboat Lounge overlooking Town Cove. A 30-foot boat serves as the bar, setting the mood for this unique room. Don & Marylou Berig look forward to your visit.